Ninjas & Superspies is the incredible world of espionage, spies and combat! Over 40 different types of martial arts enables players to create dozens of different types of martial arts masters! Mystic super abilities such as the Arts of Invisibility, Body Hardening, Zenjoriki, Dim Mak, and more. Plus Secret Agents, Cyber-Agents, Gizmoteers, gimmick weapons and clothing, super vehicles, secret agencies, secret identities, and more! All characters tough enough to take on the average superhero! Over 40 types of Martial Arts, including Ninjitsu, Kick Boxing, Aikido, several types of Kung Fu, and others. 48 Mystic Martial Arts super powers. Rules for creating secret spy agencies. Spies like the Gizmoteer and Cyborg Commando. A complete role-playing game directly compatible with Heroes Unlimited™, After the Bomb®, and Beyond the Supernatural™. Adaptable to Rifts® and the entire Palladium Megaverse®. 179 pages by Erick Wujcik. 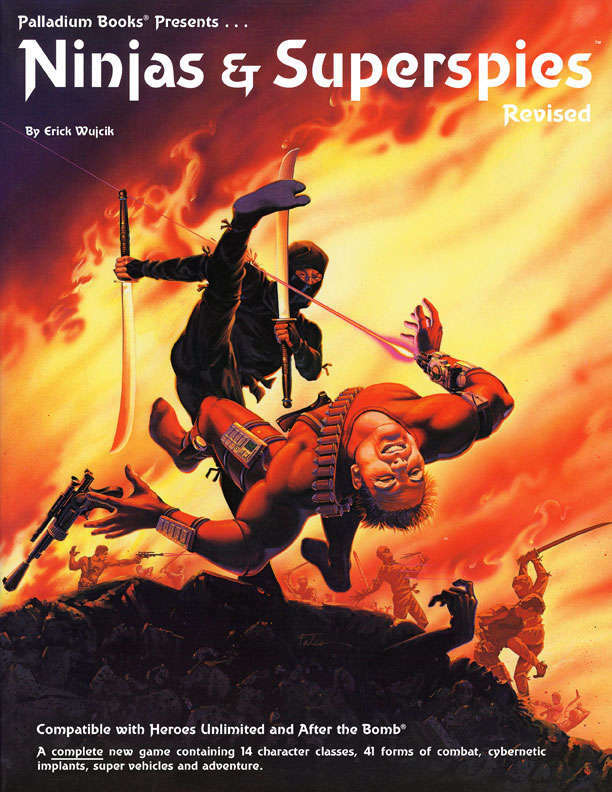 I would love to see the unrevised version of this game in PDF as well, for historical purposes (and also to get that original martial art forms setup which always made more sense to me). However I am stoked to finally get this in legit PDF form!!! One of my favorite games from the 1980's!!! Any chance of TMNT??? What was different about the 1.0 version. I've never seen it. Unrevised gave put 3 Martial Art Forms for Dedicated and 2 for Worldly Martial Artists - which I believe got nerfed primarily to not give away too many Martial Art Powers / Skill Programs at 1st level, and also to maybe trim down how much paperwork is involved in the game (which is massive even for a Palladium Game). There was also a lot of tweaking on the various bonuses in each form, and some Martial Art Powers got nerfed some too. Revised added a couple new OCC's (the Private Eye is interesting because he owns his own Agency as a class feature). I'd just like to see it up here, for completeness. They have old-school Heroes Unlimited, Rifts original and Ultimate, etc. This title was added to our catalog on July 25, 2017.